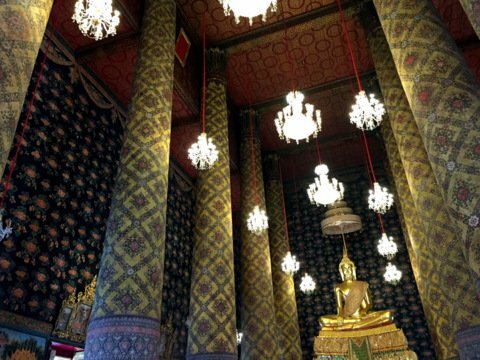 Wat Hong Rattanaram a temple from the Ayutthaya era with its beautiful architecture and décor, old Buddha statues and temple murals is located in a part of old Bangkok that’s steeped in history. In the early 1500s during the Ayutthaya era, the Bangkok Yai and the Bangkok Noi Canals formed a sharp oxbow bend in the main course of the Chao Phraya River. There was a Chinese village at the base of this bend called Ban Kok or the village of wild plums. Years later, this became the name that the rest of the world would know the Thai capital as. 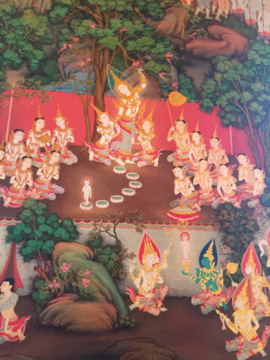 A wealthy Chinese named Hong donated funds to build a temple on the banks of the Chao Phraya. The temple was named Wat Hong or Wat Jao Sua Hong after the benefactor. During the reign of King Chairacha (1534 – 1547) a canal was cut through the base of the bend to shorten the sailing time to Ayutthaya. After time, this canal became the main course of the Chao Phraya and the oxbow bend formed the Bangkok Yai Canal to the south and the Bangkok Noi Canal to the north. The shortened sailing time to Ayutthaya also increased the threat from hostile ships. 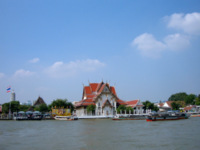 A fort was built near the confluence of the Bangkok Yai Canal and the Chao Phraya along with port, immigration and customs facilities for visiting ships. After the fall of Ayutthaya in 1767, King Taksin decided to locate his new capital further away from Burma; he chose this area in Thonburi between the Bangkok Yai and Bangkok Noi Canals. The presence of a fortified city would have been one reason. Secondly his father was Teochew Chinese and so were many of the Chinese in the community here. 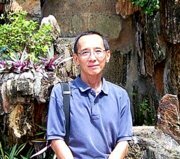 He built his palace, Wang Derm near the old fort and chose to worship at Wat Hong just 500 m to the south. 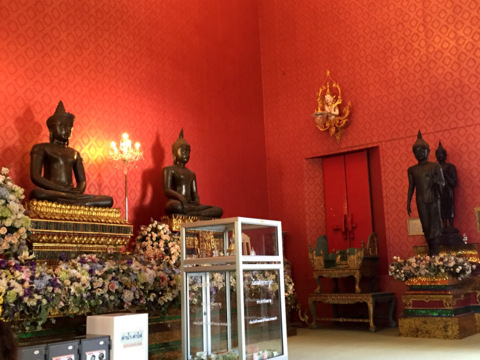 King Taksin restored the temple and renamed it Wat Hong Awat Viharn. In the reign of King Rama I the temple was renamed Wat Hong Awat Wora Wihan and later King Rama IV, changed the name to Wat Hong Rattanaram. Though Hong was originally based on a Chinese name, it also means swan in Thai and in Hindu Ramayana epic, the sacred swan (hong) is the steed of Brahma. 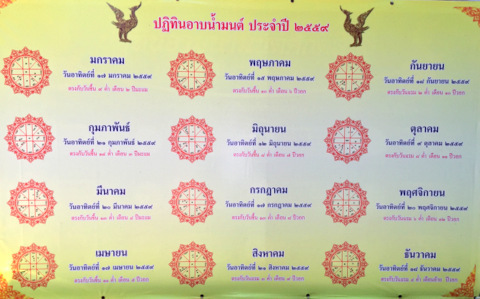 To get there, please see map to Wat Hong Rattanaram. 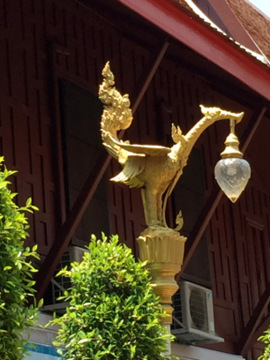 The official name of the temple is Wat Hong Rattanaram Ratchaworawihan indicating a second grade royal temple. Let’s take a virtual tour of this old temple. 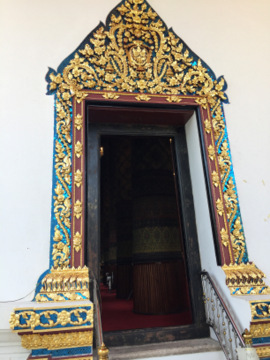 After passing through the temple gate from the carpark, the first place to visit is the viharn, the sermon hall and where Buddha statues are enshrined. 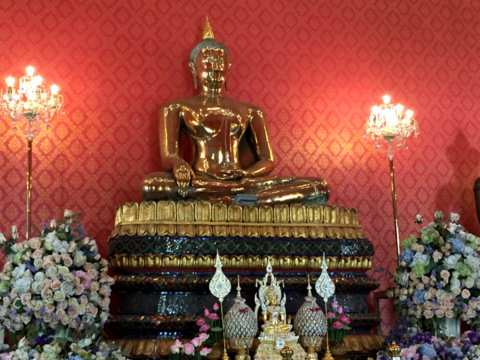 The main statue in the viharn in Wat Hong Rattanaram is one of gold and alloy from the Sukhothai period. Ancient inscriptions at the base of the statue interpreted by the Department of Fine Arts indicate that the statue was made in 1520, on the first night of the waxing moon in the third month in the Year of the Rabbit. 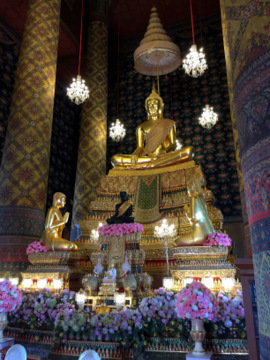 Other Buddha statues in the viharn are replicas of Buddha statues from the various periods; Dvaravati, Sukhothai, Lopburi, Ayutthaya and Rattanakosin. The main building of interest is the ubosot or ordination hall. This is the main prayer hall for worshippers and the ordination of monks. This building can be distinguished from the viharn by the sema or boundary markers around the building to indicate sacred ground. 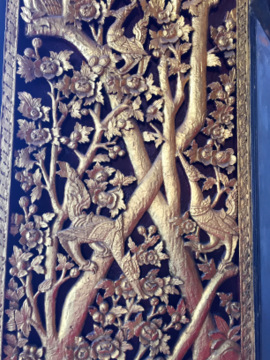 Eight sema can be seen around the ubosot; the ninth is buried in the inside the ubosot under the Buddha statue. 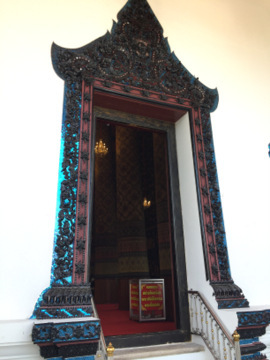 The ubosot has beautiful architecture with ornate frames for the doors and windows and sculptured doors. 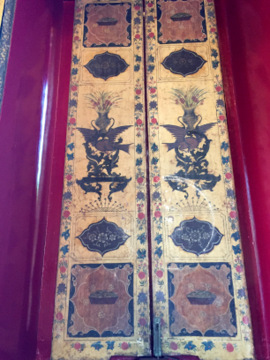 There are two rows of pillars etched with designs inside lining the way to the Buddha statue in front. Called Phra Saeng Mueang Chiang Taeng*, this statue was made from an alloy of nine metals and was installed in Wat Hong in 1858. *Chiang Taeng is located in Steung Treng province in Northeastern Cambodia which used to be part of the Khmer Empire. I’m unable to ascertain how this statue ended up here. 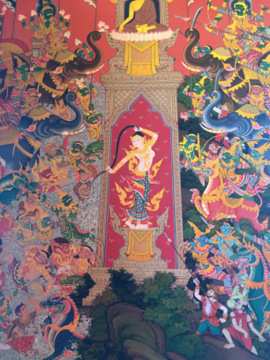 The murals that adorn all four walls inside the ubosot are simply stunning. 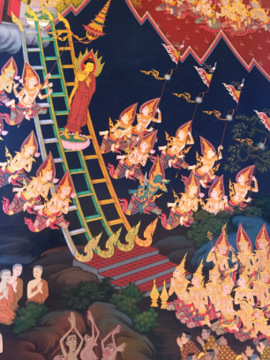 They depict the Jataka (cha – tok), tales of the former lives of Buddha. 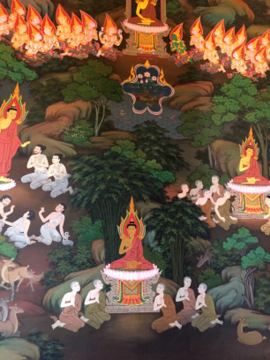 These murals appear to be recently restored as work was still in progress on one of them. 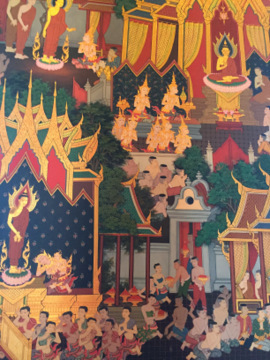 There is however one other piece of temple art that I missed; Rattana Pimpawong or the story of the Emerald Buddha, a set of painting encased in glass. Perhaps they were removed in view of the restoration works. As restoration works were in progress on the exterior of the viharn and ubosot at the time of my visit, I am unable to take suitable photos of these two buildings. 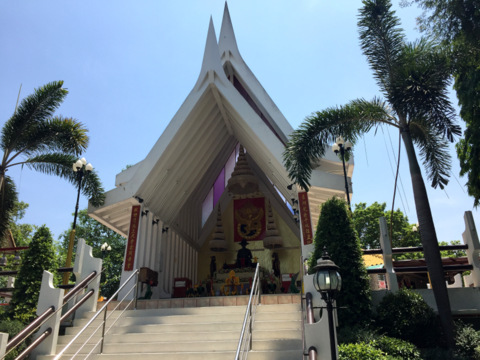 There’s a shrine in honor of King Taksin located just outside the temple near the Bangkok Yai Canal. 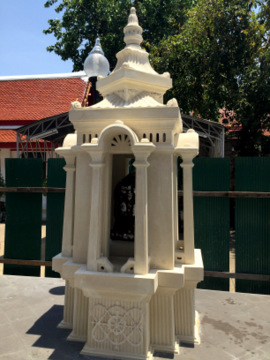 This was built by members of the community in gratitude for the king’s restoration of the temple. 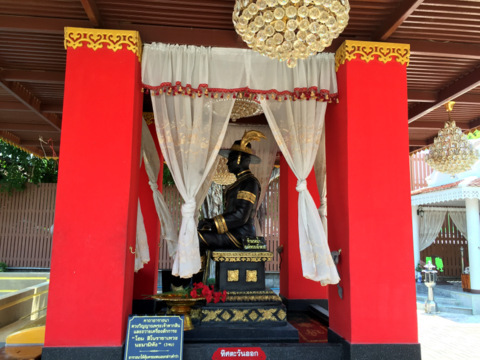 This shrine is elevated and a flight of stairs lead up to the altar where there is a statue of King Taksin. 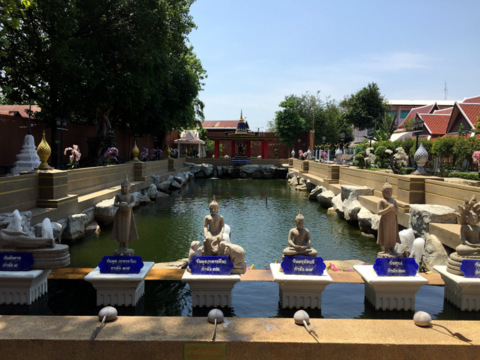 This is a special feature of Wat Hong Rattanaram, a sacred pool of holy water. King Taksin was reputed to have taken a bath in this pool before embarking on his battles against the Burmese. There’s a shrine dedicated to King Taksin at one end of the pool. The pool and the surrounding area were renovated in 2012. Monthly bathing sessions are held for followers and it is believed that those who take a bath with this water will be blessed according to which side of the shrine the ceremony takes place. 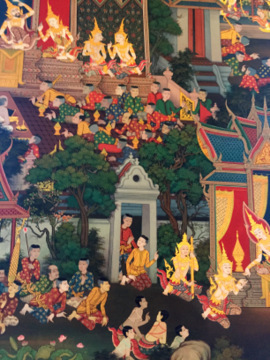 A visit to Wat Hong Rattanaram gives visitors a chance to admire beautiful Buddhist temple art, have an insight into local customs and the history of the older side of Bangkok. Please refer to the satellite map of Wat Hong Rattanaram showing the location of the various buildings mentioned. The map below shows the location of Wat Hong Rattanaram and how to get there. Take the skytrain (BTS) to Wong Wian Yai station (S8). From there take a taxi to Wat Hong Rattanaram, it’s about 4 km. 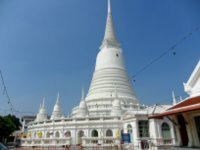 You can either take Arun Amarin Road or Itsaraphab Road; turn into Wang Derm Road then into Wang Derm Soi 2 which leads to the temple.